Whenever we travel, I am packing for five people so keeping everything organized is essential. We also have to make sure that we have easy access to my daughter’s asthma medication too. Vaultz Mesh Medicine Storage Bags makes it very easy to carry along our medicine in our suitcase, carry-on bag and even in our backpack. This is a must-have travel organizer that is the perfect solution to keeping everything securely in place. It can be used not just for medicine but for a variety of ways such as storing or organizing jewelry, pencils, small toys, beauty products etc. My husband also came up with the smart idea to fill one of these bags with first aid necessities to put into our backpack when we go camping, hiking or off road biking with the kids. Inevitably, one of us always gets an injury which needs attention and this is a wonderful way to keep what we need at our fingertips in our bag. My daughter, Hannah can also clip her asthma inhaler and other related essentials onto her backpack to take along to homeschool co-op and bible class making it easy for to find in a medical emergency when she needs it. I like that the Vaultz storage bags are made of mesh so it is very lightweight and the diagonal zipper makes it simple to open and close. The clip is another convenient feature so I can attach this product to any loop or ring as needed. For example, I put in a few essentials such as a sunblock stick, sunglasses, keys and our cell phone on a recent trip to the beach and clipped it into our beach bag keeping those items away from the sand but still easy to find. There is a wide selection of vibrant colors to choose from which I have found to make it easy to find one of our bags whenever I need to locate it and its contents. 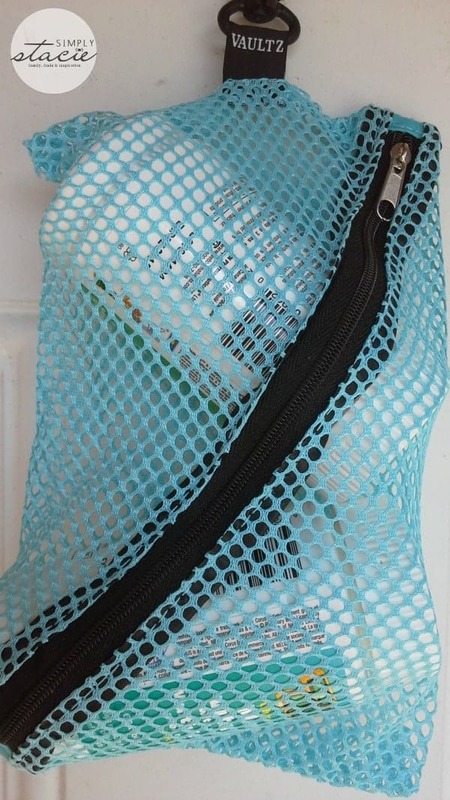 I will definitely be taking these bags along with us on our upcoming summer vacation and continue to come up with new and unique ways to use this very functional product from Vaultz! 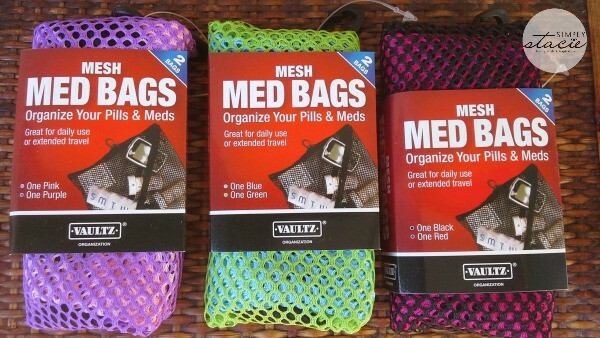 Vaultz Mesh Medicine Bags are available in a two pack and sold exclusively in the Walmart pharmacy department. You are invited to visit the Vaultz Products Facebook page to learn more about these bags as well as all the additional products available from Vaultz. I would use this to store my medicine and my childrens medicine when we go to the beach or camping. I’d use this for pills. this would be so good for my month long trip to russia! I actually would use it as a medicine bag for travel. This is really needed! I would use it to organize my meds for travel. I usually just throw medicine in a plastic sack for trips. This would be great! It would be great for vitamins and medicine! I would find alot of uses for these but the first thing I would do is use them to organize my meds.I have several health problems and take a lot of meds.Hard to keep track of them,sometimes I miss or take too my.this would be great to have. i would use these for vitamins. I would use this to carry my meds whenever I go traveling somewhere. It would be great to have them in one place. I would use these for traveling. My wife says she would use them to store her cosmetics and medicine in. Thanks for the giveaway… would use to pack my meds in my carry-on luggage instead of checked bags.